This month for my Io Volcano of the Week series, we are looking at volcanoes that were observed at moderate resolution (160-280 meters or 525-920 feet per pixel) during Galileo's I25 flyby of Io on November 26, 1999. In the last couple of weeks we have looked at Zal and Emakong, two large paterae - volcanic depressions - on Io's leading hemisphere. This week we turn our focus a few hundred kilometers to the east of Emakong at the strangely shaped lava flow field, Hi'iaka Patera. It maybe pretty quiet as far as Ionian volcanoes go, but it may have had a wild past with a violent formation from the breakup of two massive mountains and lava flows that formed in the 17 years between Voyager and Galileo. Let's get some of the basics out of the way first. Hi'iaka Patera is located near Io's equator on the moon's leading hemisphere (3.64° South, 79.47° West) and is 128 kilometers (80 miles) wide. The oddly shaped volcano is bounded by a set of low faults that confine a lava flow field on the eastern side of the volcanic depression. The western edge of Hi'iaka is bounded by a 3.5-kilometer (2.2-mile) tall massif named North Hi'iaka Montes. The southern margin of the volcano is less than 10 kilometers (6.2 miles) from the northern tip of another mountain, South Hi'iaka Montes. Images of Hi'iaka taken during that Thanksgiving 1999 flyby were particularly useful for determining how the volcano may have formed. Observations of the spatial relationships between these two mountains and the volcano, the comparable heights for the two mountains (save the tall peak on the northeast tip of North Hi'iaka Montes) led to the suggestion that the two mountains were once joined. Subsequent extension and strike-slip tectonism then rifted these two mountains. 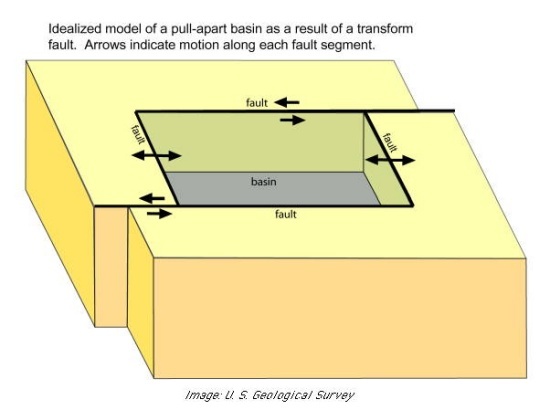 In this scenario, Hi'iaka Patera may be a pull-apart basin, which forms when there is a bend or gap in a strike-slip fault system, creating extension at the bend. The image at left shows a schematic of these basins are formed. 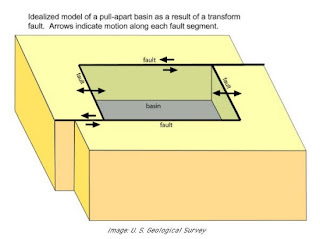 Depending on the speed of the rifting, lava can exploit the faults along the margin of this basin to reach the surface and cover portions of the depression that is formed between the two transform faults [this scenario was further explained back in December 2009 and February 2009 when I discussed work performed by Melissa Bunte and her co-authors]. Lava using extensional faults on Earth certainly isn't unheard of. The East African Rift Valley has a number of prominent active or dormant volcanoes (*cough* Kilimanjaro), and fissure eruption are not unheard of in the last few million years. The active lava lake, Erta'ale, is located in the Afar triangle and the triple junction between the Red Sea, the Gulf of Aden, and the East African Rift Valley. The motions of Ionian micro-plates like that suggested for Hi'iaka Patera may have resulted in the formation of several volcanoes including Zal, Monan, and Shamshu, though additional information on Io's sub-surface will be needed to pin down this theory, since later deposition of volcanic ash and sulfur has obscured most surface expressions of tectonic faults on Io's surface. In term of recent activity, Hi'iaka is a relatively quiescent. While there are dark lava flows with different albedos (and presumably ages) covering much of the eastern half of the depression, no high-temperature eruptions have been observed at the site. Galileo's Near-Infrared Spectrometer observed thermal emission from the volcano on six occasions during the Galileo Nominal Mission, but it was never seen by camera system during an eclipse, even though the nearby volcano, Tawhaki Patera, was. 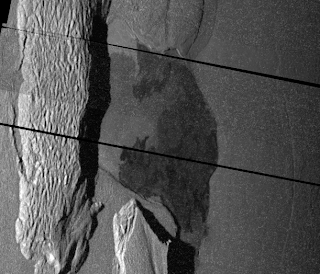 This suggested that low levels of effusive activity were present at Hi'iaka during the Galileo mission, which is consistent with the morphology of the dark lavas seen in the high-resolution Galileo images. Bunte et al. 2010 suggested that Hi'iaka Patera might be a lava lake, or in the process of forming one. At present, however, the morphology of the dark lava at Hi'iaka, with its multi-lobed structure and suggestions of a series of overlapping flows, is more consistent with an inflated flow field that is built up by a series of thin lava breakouts. Similar eruptions, though more vigorous, are seen across Io at volcanoes like Zamama, Prometheus, Marduk, and Amirani. That's not to say that more vigorous eruptions are not possible. 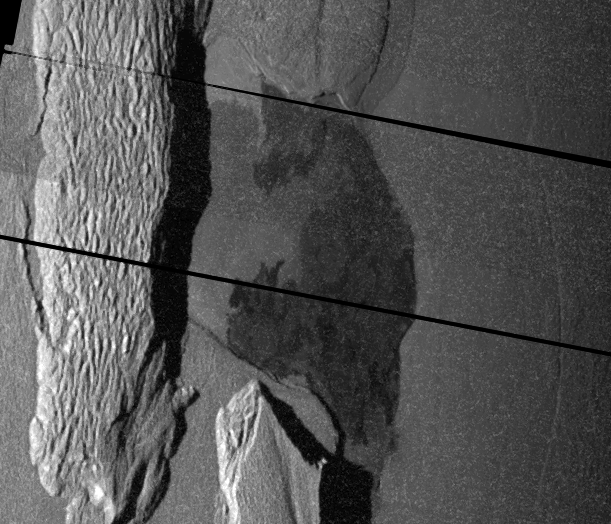 A faint, reddish plume deposit was seen surrounding Hi'iaka when Galileo first started imaging Io in June 1996 that slowly faded as the mission progressed. Even more curiously, Hi'iaka is barely visible in Voyager images of the region taken in 1979. 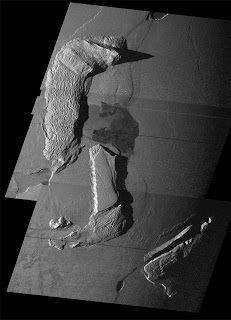 This suggestions that the lava flows Galileo and later New Horizons saw at Hi'iaka formed between 1979 and 1996, in same time frame as Zamama and the new flow fields at Prometheus and Culann. Using the Pillan eruption as a possible template, perhaps it is possible that these flow fields built up quickly, on the scale of only a few months. As the eruptions died down, activity at these volcanoes may have transitioned to from a violent, fire-fountaining, outburst eruption to a more quiescent insulated lava flow. However, given the number of years between Voyager and Galileo, there is no reason to require an initial outburst at these flow fields, and they may have built up gradually over the 16 year time span. However, I will point out that only minor expansions of the extent of these flow fields were ever seen during 4 years of the Galileo mission at Io. Several outbursts were known to have occurred in Hi'iaka's region (or at least its hemisphere) during this interval that may have resulted in the initial creation of the Hi'iaka flow field, including a bright outburst seen in 1986 that provided evidence for silicate volcanism on Io. That's it for this week's star volcano, Hi'iaka Patera. Come back next week when we will profile the colorful Culann. Johnson, T. V.; et al. (1988). "Io: Evidence for Silicate Volcanism in 1986". Science 242 (4883): 1280–1283.